Recently published studies have provided new evidence for a role of oral health on risk of cancer. 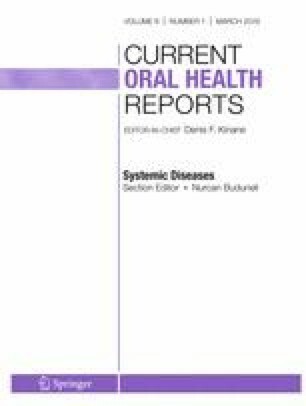 This review summarizes the latest research on this topic, including several new cohort studies that have examined associations on periodontal disease and cancer risk. The most consistent findings for associations with periodontal disease have been observed for lung cancer; five out of seven studies have reported statistically significant increases in risk of lung cancer. For pancreatic, colorectal, and head and neck cancers, the associations are less consistent across studies, and the overall summary relative risk estimates are not statistically significant. However, these associations remain of interest, given the limitations of existing data (i.e., measurement error in periodontal disease assessment and small sample sizes), and growing support for biological mechanisms on how bacteria previously linked to periodontal disease may play a role in carcinogenesis. Future studies need improved assessment of periodontal disease in population-based studies to determine if heterogeneity of current studies resides with measurement error. Periodontal disease treatment and prevention may turn out to be important targetable cancer prevention strategies. Research supported by the 2018 AACR-Johnson & Johnson Lung Cancer Innovation Science Grants Number 18-90-52-MICH.
Del Castillo E, Meier R, Chung M, Koestler DC, Chen T, Paster BJ, et al. The microbiomes of pancreatic and duodenum tissue overlap and are highly subject specific but differ between pancreatic cancer and noncancer subjects. Cancer Epidemiol Biomarkers Prev. 2018. https://doi.org/10.1158/1055-9965.EPI-18-0542.